Merry Christmas, Donna!! Wow, that pillow turned out so great, love that you took it on. And your mantel is absolutely stunning, as always. You have quite the collection of mercury glass and pretty baubles & always display them so well. I hope you have a wonderful Christmas this year!! Your pillow is beautiful, I wish I could sew I would make so much more stuff for myself. Great job. I think your pillow is far better, I love the background colour and the white leaves. I love to see when someone actually makes an item that looks better than the original, especially at a fraction of the price. You did a wonderful job. Love the pillow. If anyone has a Accucut machine used for quilting you could find a leaf pattern put some fusible on the back of some white wool and cut and press on the leaves in no time. Ohh, I love this! As in totally adore this! 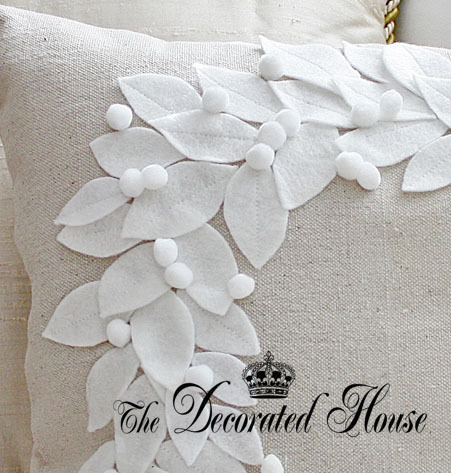 It looks so elegant and well put together, what a fun project to do! I'm totally trying this myself when I have a moment of "no-projects-on-the-horizon"! Very well done! Thank you ladies for all your sweet comments. And thanks for the tip about different machines that will make the leaves for you. 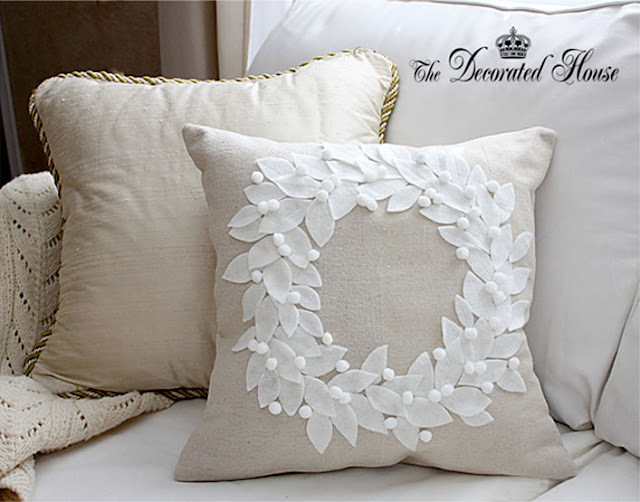 It would have cut the time much shorter and made this pillow really easy to make! I hope a few of your made your very own to enjoy! 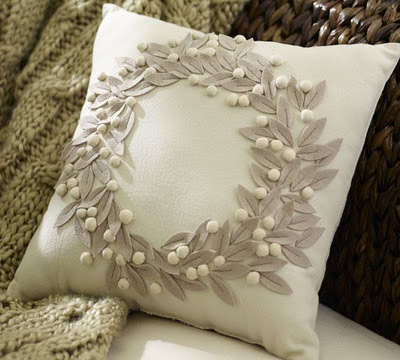 Are you considering selling any of your white wreath pillows?